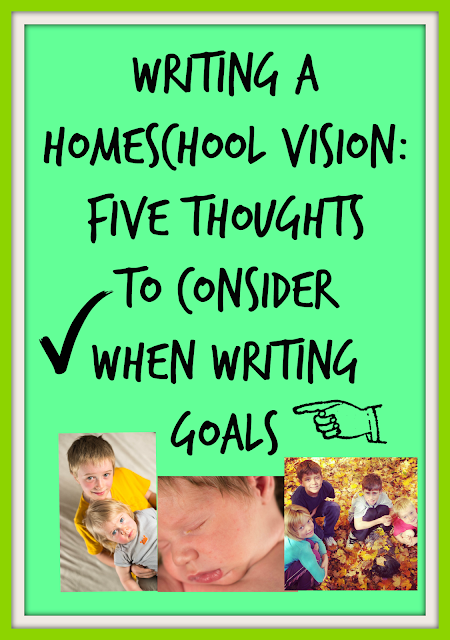 What is the definition of a vision for your homeschool? that represents the core set of values that your family upholds in regards to homeschooling. Which curriculum you will choose. How you will organize yourself. What type of schedule you will keep. Which extracurrricular activities you will enroll in. So how exactly DO you come up with your own unique homeschooling vision? seeking Him for direction, He will guide us. 2) Talk to your spouse and/or children. ultimately decided to give this lifestyle a try. So, how do you get unified with your spouse? looks like. Ask what is important to them. Don't leave this conversation to chance! Set aside a time to do this. KEY: Also, re-evaluate from time to time to discuss what's working & what's not. in them? This info can also be helpful in setting your course. 3) Get the end goals in mind, then work backwards from there. break down incremental steps that you will take to get there. will be thrown into the mix. influenced our schedule & which curriculums we are using! 4) Leave room for "life to happen" (be flexible!). You may have more children enter the mix. Your financial circumstances may change. You may have to start working part-time. You may end up moving. A loved one may end up needing you to care for them. In general, life does NOT go exactly as we plan! If we set our goals, leaving room for the "unthinkables"
kilter. We need to remain open to change. the One who knows what's ahead. 5) Don't allow other's decisions to derail your efforts. Yes, we can always glean from others. we also want to succeed in. Being teachable can take us a long way. However, you are not them! However, once you've set your course, keep it set! Do you have a list of homeschooling goals? If you do, feel free to share in the comments section below. Excellent advice Rachel! Homeschooling with a clear vision is so important, and it makes the decision-making process on curriculum, activities, etc. so much easier. 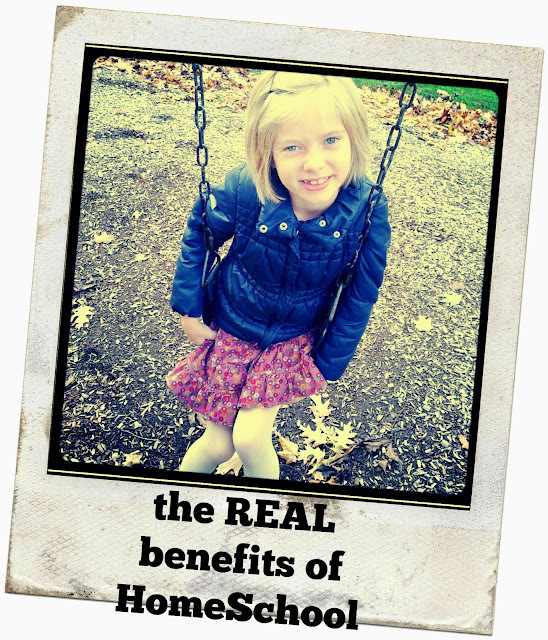 Thanks for sharing your post at NextGen Homeschool's Homeschool Mother's Journal link-up! We were advised to write out our reasons for home educating for the difficult days when we wondered whether it is all worthwhile. This was such helpful advice. Knowing the reasons does dictate the goals. I have tried to do a vision statement and have tried to get my husband's opinion on what to do. It is actually a pretty hard process. Especially when it's all on one person's shoulders. I really like your list and find I have done some of them. My goals always start with prayer and asking God what He wants for my kids. And then I ask him to help me see what curriculum/character traits/etc I need to use/work on/etc. IF God wasn't guiding it at all, I don't think I could move forward in it. Our homeschool vision is really just an extension of our family vision. Both center on knowing and serving the Lord. I am blessed that my husband is invested not just in our family overall, but in our lifestyle of learning as well. 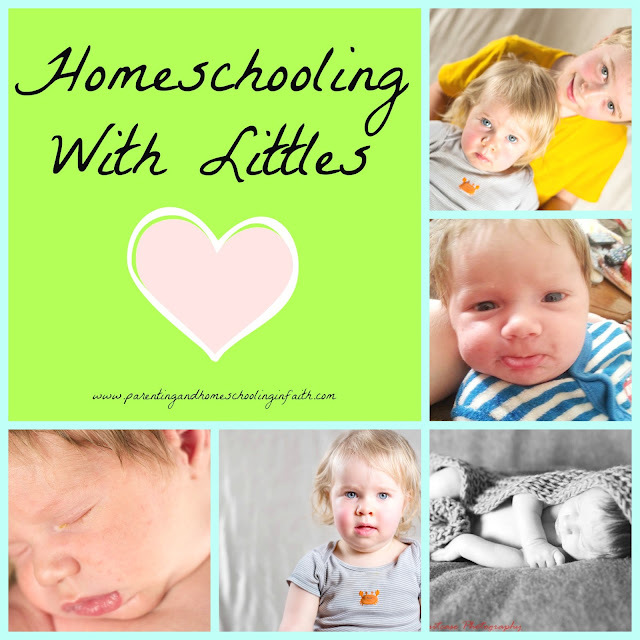 We are starting homeschool with my little ones in the fall. I love your idea of having an actual "vision" for your school before getting starting picking all the other nuts and bolts of school. I've been so busy researching curriculums, routines, and resources getting increasingly confused because they are all so different. Having a vision as you suggest would really help to sort out the options. Plus, I really like the practical suggestions you offer to get there. Excellent! Thanks for a very organized and informative read! I love setting goals. I feel like I accomplish so much more when I do. I really like # 1 and #4 Prayer is so essential to anything we determine to do and being flexible is really key to surviving homeschooling;) Great goals and inspiration here! Wise words Rachael. I've been homeschooling for twenty years now and find it changes every year. In the beginning, I compared a lot...not so much now. God gave these kids to me, because he knew I was the best mama for them. Same with you and every other mama. Thanks for talking to me at Harvest Lane Cottage. You honored me. I will be delighted to see your name come through my email again! It is amazing to me that when I forget to pray, everything takes longer and is more difficult. The moment I sit down to pray, things fall into place. Two years ago, I was trying to figure out curriculum and prayed. The next morning I sat down at the computer, and the first posting I read on Facebook led me to a new curriculum choice that was just what I needed. You are SO right about setting goals - vision is essential! I have to admit I haven't always been good at that over the years, but most definitely when I've been able to communicate a vision to the kids - and have gotten them to "own" it for themselves - THAT's been key to all of us feeling like the year went well! 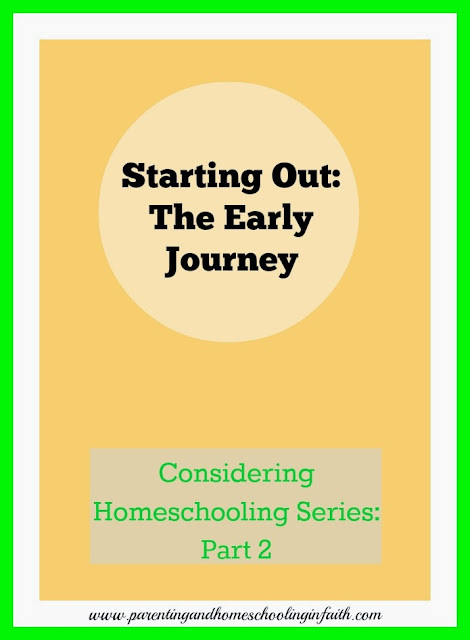 Sometimes it's easy for new homeschoolers especially to get caught up in what to teach that they may not consider the big picture. Easy to do, that's for sure. This is great! It's so important to have a vision- something you're working towards. Otherwise you're blown about by any and every idea you hear. Having focus and goals as you mention can help guide our day to day choices.